SOCRATES POP is all about working safely with laptops and tablets in library and learning environments. 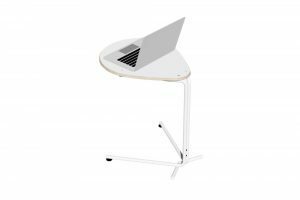 SOCRATES POP is a modern take on the traditional study carrel, it looks great and provides all the space you need for your laptop and extra support material. An oval worktop with plenty of layout space. A cast aluminium 5 star base. A stylish, ‘Angel Wing’ privacy screen. Mount on either glides or castors.